What products do I need for a fully functional communication system? Storage / Transportation Case: for the protection, safe storage and transportation of the equipment. We also have charging cases. Headsets: both the transmitters and receivers need a headset. The transmitter needs one with a microphone and earphone for speaking and listening. Receivers need a headset with earphone. In the case of duplex communication systems (speaking and listening), receivers also need an microphone on the headset. How many transmitters and receivers do I need? The number of channels depends on how many people talk in a single group. What type of headset does Axitour provide? Clear communication all depends on having a good headset. Therefore, Axitour has a wide range of headsets; of standard earphones to the most exclusive tailor-made headsets. For which applications can I deploy communication systems? 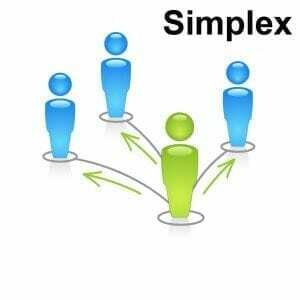 What is a simplex communication system? Simplex communication is communication in which information is only sent one way. This type is mainly found in broadcast networks where one source disseminates information. Receivers don’t send information back to the sender. Axitour provides, among other things, simplex communication systems and transmitters which can pass the signal to as many as 250 receivers. We have two such communication systems in our assortment: the Axitour AT-300 system and Axitour AT-500 system. 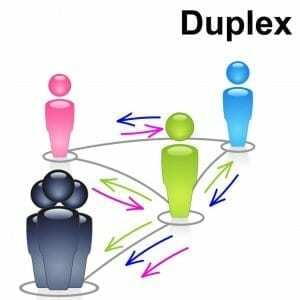 With full-duplex communication system, it is possible to establish a connection in which, at the same time, information can be exchanged in two directions, just like a phone call. In the communication technology, with half-duplex, it is possible to send information in two directions but not at the same time. A half-duplex communication system, for example, is a walkie talkie. We have one full-duplex communication system in our assortment: the AXIWI systems. Do I need a simplex or duplex communication system for my application? That depends on how you want people to communicate. If you want one speaker and those who attend to listen, you need a simplex communication system. If the audience are supposed to talk back, then you’ll need a duplex system. Can I use my own headphones combined with a Axitour communication system? The systems of Axitour have a standard 3.5mm jack. Is there a minimum amount I need to buy or rent? How is rental equipment sent? We send our rental equipment via DHL. We provide the equipment a day before the system is actually put to use. It’s also possible to pick up equipment at our showroom. How do I sent my rental equipment back? Always send the rental equipment back in the same case you received the equipment. How does the delivery of a leased system work? We make an appointment with you to deliver the equipment at any address and date (and possible time). We supply the communication system(s) one day before the actual use of the system. The communication system is fully charged. If you rent for only one day, you don’t have to charge it. If you rent for several days, you have to charge the system for the following days. If rented for several days, we always supply a charging case. We will ship the package in a box. Do not throw away this box! Because it must be used to return the communication systems. How does the return of a leased system work? After the last day of the rental period, we pick up the communication system. Our advisor makes an appointment with you for that. The system is returned in the same way you received it. You can put the transmitters and receivers in the slots in the case. The cords are also neatly stored in the case. The case(s) are then put in the box in which you received the communication system.